This is it, fans! You demanded it, and IDW Publishing listened! The entire Image Comics TMNT run (a.k.a TMNT Volume 3) reproduced for the first time ever in full, four-color glory! 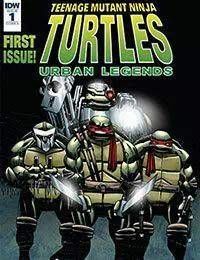 Join creators Gary Carlson and Frank Fosco as they take the Heroes in a Half-Shell on some of their most amazing and dangerous and bizarre adventures ever… culminating in three brand-new issues by Carlson and Fosco to properly close out this long-beloved storyline at last! In this premiere issue, the TMNT and Master Splinter are attacked in their lair by a group of cyborgs led by the female ninja called Pimiko. Before the attack is over, one family member will fall… and one will be lost! Dont miss your chance to get in on the ground floor of the entire TMNT Image experience!